Stripes must be in the air this summer, as my other recent crochet pattern was also a striped number. 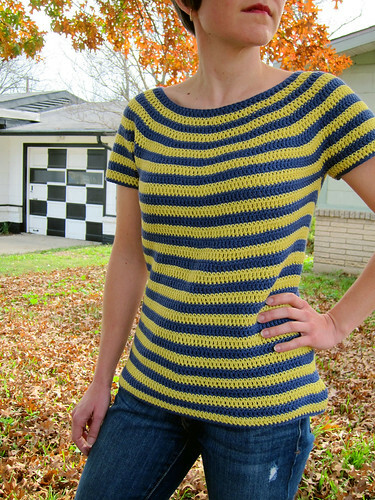 I kept it really simple in this pattern, dubbed the Gidget Tee by Interweave Crochet (it’s in the Summer 2012). This easy tee is worked top down, in the round from worsted weight Classic Elite Chesapeake yarn (which was lovely to use!). It’s sized to fit a range of 6 sizes from 30″ to 50″ at the bust and is on my list to make again for me, at some point. I think it would be a great scrap buster–in fact, check out this awesome Surf Sweater rendition on Ravelry if you are interested. Since it’s top down in-the-round, you can try it on as you go and easily change the sleeve length, shaping, and overall length if desired. It’s a total zen project requiring only simple stitches and increases/ decreases, and would be super easy to convert to a long sleeved pullover–but maybe you can just make most of it now and then add the long sleeves come fall! Here’s a photo of my sister Mary wearing it. It’s a bit too big for her, but you get the idea. The yarn, which was a wool/cotton blend, had a lovely drape and sheen. I think you might also be able to get away with certain DK weight cottons for this, but of course you should check your gauge. If you make this pattern, I’d love to see you add it to Ravelry. Catching up -- love the top! I went out and bought the magazine immediately after seeing your post. Love the stipey sweater!